PRODUCT: 20 MM WIDE x 2 MM SLIT, ANGLED, HOT-AIR WELDING NOZZLE (type 107.123). PRICE/EACH. FITS MOST HAND HELD HOT AIR WELDERS INCLUDING TRIAC, BAK RION, SIEVERT TH1650 AND OTHER POPULAR HAND WELDERS. 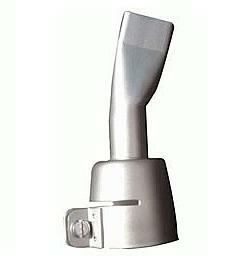 POPULAR ROOFING NOZZLE FOR SMALL REPAIRS. SPECIFICATIONS: PRECISION FABRICATED WITH 304 STAINLESS STEEL.